Dimensions 0.25 by 5.25 by 8.50 in. Amazon.com description: Product Description: Since its original publication in 2000, Leadership and Self-Deception has become a word-of-mouth phenomenon. Its sales continue to increase year after year, and the bookâs popularity has gone global, with editions now available in over twenty languages. This new edition has been revised throughout to make the story even more compelling. And drawing on the extensive correspondence the authors have received over the years, they have added a section that outlines the many ways that readers have been using Leadership and Self-Deception to improve their lives and workplacesâareas such as team building, conflict resolution, and personal growth and development, to name a few. Read this extraordinary book and discover what millions already have learnedâhow to consistently tap into an innate ability that dramatically improves both your results and your relationships. About: Since its original publication in 2000, Leadership and Self-Deception has become a word-of-mouth phenomenon. 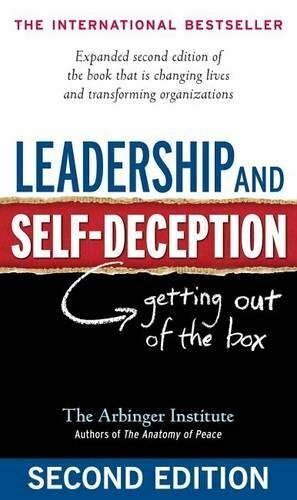 About: Explains why self-deception is at the heart of many leadership problems, identifying destructive patterns that undermine the successes of potentially excellent professionals while revealing how to improve teamwork, communication, and motivation. from Turtleback Books (January 1, 2002); titled "Leadership and Self Deception: Getting Out of the Box"
About: For too long, the issue of selfdeception has been the realm of deepthinking philosophers, academics, and scholars working on the central questions of the human sciences.